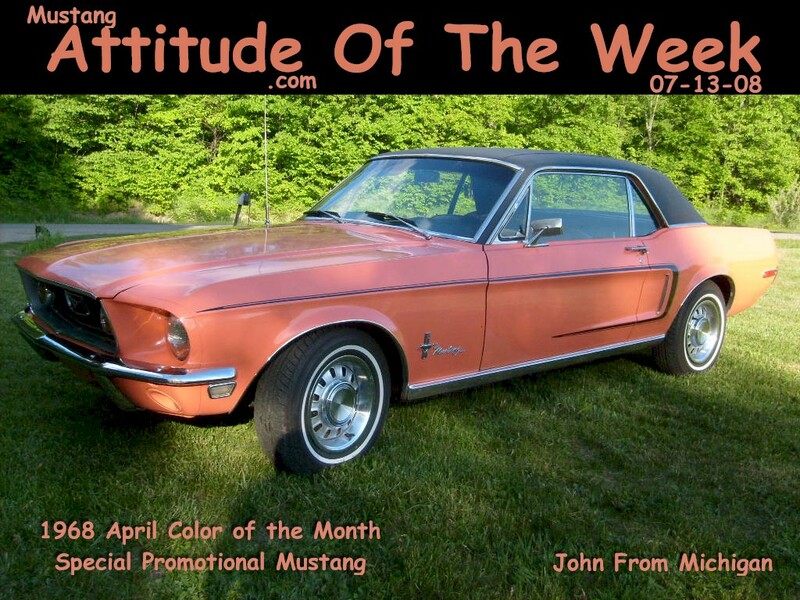 (8 photos of a 1968 Cardinal Red Mustang Cardinal Edition Hardtop) This is a special Cardinal Edition 1968 Mustang. A limited number of these were built for Virginia and North Carolina areas. The Cardinal is the state bird of Virginia. They are all hardtops and came with Cardinal emblems, flip-open chromed gas cap, black interior, black side "C" stripe, wheel lip moldings, wheel covers, 200ci inline six cylinder engine, and special paint. The Cardinal Red paint is actually Candyapple Red, a standard 1968 Mustang paint. (8 photos of a 1968 Candy Apple Red Mustang Convertible) Candyapple Red 1968 Mustang convertible with some of the GT options. It has the 195hp (at 4600rpm), 289 cubic inch, 2 barrel V8 engine - which was not available on the GT in 1968. Other options include wheel covers, fog lamps, metal rocker panels, gray side C stripes, power steering, power convertible top, and hood mounted signals. (1 photo of a 1968 Sunlit Gold Mustang Golden Nugget Special Hardtop) Sunlit Gold 1968 Gold Nugget Special Mustang hardtop which was only sold in the Seattle/Oregon area. We are still working to determine if a special darker version of Sunlit Gold called Anniversary Gold was used, but the ad from 1968 says Sunlit Gold. Other standard options in the Gold Nugget special package was a 4 speed manual transmission, power steering, AM radio, center console, deluxe seat belts, black vinyl roof, performance tires, wheel covers, louvered hood, and front fascia integrated turn signals. (8 photos of a 1968 Seafoam Green Mustang Challenger Special Hardtop) This amazing 1968 Seafoam Green Mustang Challenger Special hardtop is owned by Kerry Wortman of Vista, California. The Mustang Challenger is a Mississippi promotional Mustang which featured all the horsepower of a Mustang Shelby GT350 in a Seafoam Green, black vinyl roof hardtop with white side C-stripes and black Deluxe interior. 21 Seafoam Green, black deluxe interior, 302ci V8, 3-speed, hardtop Mustangs with VINs in the 8F01J193649-70 range were modified by the ordering dealer in New Orleans with Shelby intakes and a special 4118 Holley carburetor, before being sent to Mississippi. There were also a few 289ci V8, 4-speed Mustangs in this promotion.